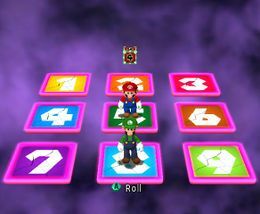 Panels of Doom is a one-on-one minigame in Mario Party 4. Normally played against Bowser in Party or Story Mode at Bowser's Gnarly Party, this minigame can also be played with a friend once it has been played against Bowser. The game is set on a 3x3 grid with tiles numbered one through nine. One player picks a tile and stands on it. The second player does the same. Players take turns hitting Dice Blocks, with the number appearing on the Dice Block causing the tile with the same number to collapse. The game ends when either player rolls a number that makes the other player or themselves fall. A special possibility is one player rolling the other's face on the Dice Block, causing the other player to fall immediately, resulting in an automatic win. When the player is against Bowser (on Story Mode or Party Mode) in this minigame, sometimes Bowser will accidentally roll his own number and make himself fall resulting the player to win. Koopa Kid – "Match Dice with Bowser! First, you must pick a number. Then we roll the Dice! The place matching the number on the Dice will crumble and fall away! If you roll the Dice, and get your opponent's face, then you win instantly!" This page was last edited on December 11, 2017, at 10:28.